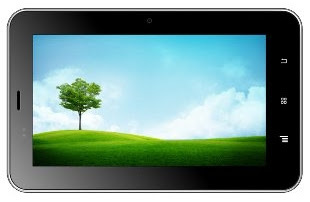 Indian mobile manufacturer karbonn planning to launch its new tablet Karbonn Ta-Fone A34 in India. It is a 7 inch tablet, which is come with 800 x 480 pixel capacitive touchscreen. Main feature of the tablet is it has dual SIM card slot (GSM + GSM) with voice calling facility. Karbonn Ta-Fone A34 now spotted on Infibeam.com for sale at Rs. 7,290 INR and Rs. 440 INR discount available using the promo code KAR440. Karbonn Ta-Fone A34 runs on Android 4.0 Ice Cream Sandwich OS and it powered by 1.0 GHz Cortex A9 Single-core processor with 512 MB of RAM. It packed with dual cameras 2 Megapixel rear camera and 0.3 Megapixel VGA front cameras. 4 GB internal storage space available for storage needs. External memory expandable up to 32 GB via Micro SD card slot. The tablet offers connectivity facility through EDGE, Wi-Fi (802.11 b/g/n), Bluetooth, and 3.5 mm Audio Jack. The device built in with 3000 mAh rechargeable battery. The tablet officially launching soon in India. It is a nice tablet with android, 1 GHz Cortex A9 processor and High Quality 17.8 cm Capacitive Touch Screen with pinch in zoom any many more.